Readers savor their memories of campus cuisine. By Irene F. Haines Mitchell (AA ’74), Louisa, Va. I was a freshman in 1966 and was living pretty much hand to mouth. I had a sleeping room off campus and ate my meals on campus. By each month’s end, money was slim. One day around the lunch hour I was sitting in the Cougareat savoring a single hamburger with my last bit of money. With the precious hamburger in my right hand and my attention buried in my anthropology notes, I slowly became conscious of being watched. I turned my head to the right and saw, only a couple of inches from my face—and from my meal—a live cougar giving my poor burger a hearty sniffing. To this day I can’t explain why I did what I did next. I slowly reached over with my left hand, took the burger, and moved it as far away from the cougar as I could reach. 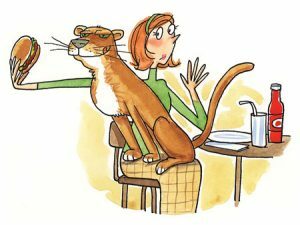 The cougar, perched on the edge of the seat, simply stepped into my lap and followed my hapless meal, sniffing furiously. With my lap full of mountain lion, my meal in jeopardy, and me too surprised to be scared, I didn’t know what to do next. I figured this magnificent creature must have smelled the cooking and wandered down from the hills and into the back of the Cougareat unseen. I soon discovered it was nothing so exotic when a voice called out, “Sparrow! Leave the kid’s food alone.” Sparrow’s owner pulled on the leash that hung down her other side, and, in a second, my Wild Kingdommoment was over. The next time I saw Sparrow was at the BYU game two days later. Sparrow, it turns out, was the school’s live mascot. As newlyweds and seniors, my husband and I decided to revisit our freshman stomping grounds one summer day with a lunch date to the Morris Center. Incidentally, my husband had left most of his hair behind in Finland when he completed his missionary service there. As we approached the cashier at the entrance to the cafeteria, the hostess smiled at my husband and asked, “Just you and your daughter today?” The food served that day was excellent, including the slice of humble pie! My early-morning shift in the Cannon Center dish room was over, and I was sitting in the snack bar with one of my coworkers. Off duty for the day, we were now contemplating what we should order for our own breakfasts on a January morning. A pretty redhead opened the snack bar each morning. She always made several treks through the dish room, retrieving supplies to stock up for the day. The mainly male dish room crew took notice, of course. She smiled but was not deterred from her duties. I had introduced myself to her the previous day. We had discovered that we had both been reared in Idaho and come from large families. Our conversation had been polite and brief as she went about her duties and tended to the needs of the other patrons. That morning as we awaited our order, my friend kept trying to pursue a conversation with her. My friend was a little odd. His social skills were blunt, bordering on offensive. He had once talked the redhead into going with him to a BYU football game. But she had decided she did not want to encourage him further. Before I left the snack bar I learned her name—Carma Garner. Consulting the student directory, I found her phone number. That afternoon I dialed and held my breath. When she came on the line I told her who I was and added, “If we’re going to get married, I guess we’d better go on a date first.” She agreed, and in June we were married in the Idaho Falls Temple. By Robert “Roman” Montague (BS ’84), Rocklin, Calif. While at BYU I worked at the Cannon Center as a food server. I soon learned what an opportunity it presented for honing my introductory skills on the many female patrons who came to eat. In the fall of 1985 I noticed a blue-eyed beauty who always came in late and sat by herself as she ate dinner. I announced to the otherwise all-female crew that, as an employee of the university and a representative of Food Services, I felt it was my duty to ensure that every student had a positive eating experience and that I was going to assist this particular student in having such an experience. The first night I approached her and asked if I could get her something, she replied, “Away.” The crew laughed. The second night I pulled up a chair and just smiled. She finally asked what I wanted. “To get you something,” I said. Again she replied, “Away.” The crew laughed again. Knowing the orange juice machine was on only in the morning and that we could serve only food that was on the menu, with a gleam in her eye she asked for orange juice, cherry cheesecake, and milk. I brought her a frozen can of orange juice, a glass of milk, a slice of cherry cheesecake reserved for the training table, and a napkin with two forks wrapped inside. 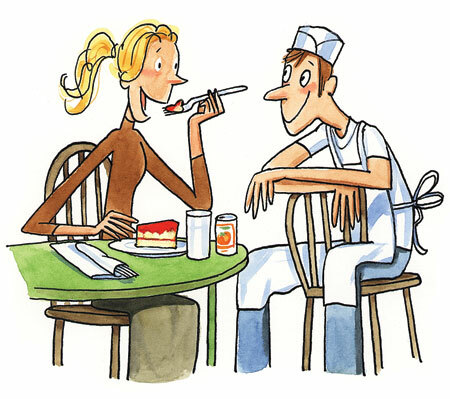 “What’s the second fork for?” she asked. After eating all but the last bite of cheesecake, she changed forks, scooped up the last bit of cheesecake, and offered it to me with a grin on her face. We’ve now been married 23 years. As a music major at BYU, I had spent another long day practicing in a small HFAC practice room, juggling loads of homework, and ushering at the de Jong Concert Hall. I stopped by the Cougareat for a late-night snack before heading back to my apartment. On the other side of the Cougareat I noticed two individuals eating fries and ketchup. One was Professor Reid N. Nibley. Anyone in the music department readily recognized this musician as a wonderful, gentle man, extremely accomplished on the piano, brilliant in composition. What made this experience unforgettable for me was noticing that the young girl who accompanied him was noticeably disabled. Cheerfully and messily, they sat in the booth eating their fries and ketchup. Brother Nibley was markedly tender, attentive, and affectionate. I’ve often thought of this wonderful scene when I’ve heard the song “I’ll Walk with You,” found in the Church’s Children’s Songbook. The song, composed by this sometimes overlooked, quiet man and now sung by Primary children throughout the world, teaches of accepting those who may not talk or walk like most people do. Today, when I hear this song, I remember the late-night scene in a Cougareat booth with warmth, admiration, and deeper understanding.